Writing in the journal Current Biology, the team says it is the first example of tool use in octopuses. One of the researchers, Dr Julian Finn from Australia's Museum Victoria, told BBC News: "I almost drowned laughing when I saw this the first time." He added: "I could tell it was going to do something, but I didn't expect this - I didn't expect it would pick up the shell and run away with it." The veined octopuses (Amphioctopus marginatus) were filmed between 1999 and 2008 off the coasts of Northern Sulawesi and Bali in Indonesia. The bizarre behaviour was spotted on four occasions. The eight-armed beasts used halved coconuts that had been discarded by humans and had eventually settled in the ocean. Dr Mark Norman, head of science at Museum Victoria, Melbourne, and one of the authors of the paper, said: "It is amazing watching them excavate one of these shells. They probe their arms down to loosen the mud, then they rotate them out." 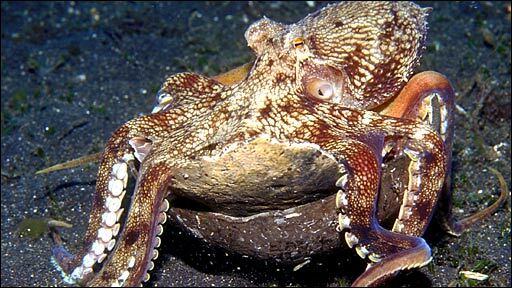 After turning the shells so the open side faces upwards, the octopuses blow jets of mud out of the bowl before extending their arms around the shell - or if they have two halves, stacking them first, one inside the other - before stiffening their legs and tip-toeing away. Dr Norman said: "I think it is amazing that those arms of pure muscle get turned into rigid rods so that they can run along a bit like a high-speed spider. "It comes down to amazing dexterity and co-ordination of eight arms and several hundred suckers." 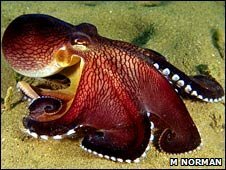 The octopuses were filmed moving up to 20m with the shells. And their awkward gait, which the scientists describe as "stilt-walking", is surprisingly speedy, possibly because the creatures are left vulnerable to attack from predators while they scuttle away with their prized coconuts. The shells provide important protection for the octopuses in a patch of seabed where there are few places to hide. Dr Norman explained: "This is an incredibly dangerous habitat for these animals - soft sediment and mud couldn't be worse. "If they are buried loose in mud without a shell, any predator coming along can just scoop them up. And they are pure rump steak, a terrific meat supply for any predator." The researchers think that the creatures would initially have used large bivalve shells as their haven, but later swapped to coconuts after our insatiable appetite for them meant their discarded shells became a regular feature on the sea bed. Professor Tom Tregenza, an evolutionary ecologist from the University of Exeter, UK, and another author of the paper, said: "A tool is something an animal carries around and then uses on a particular occasion for a particular purpose. "While the octopus carries the coconut around there is no use to it - no more use than an umbrella is to you when you have it folded up and you are carrying it about. The umbrella only becomes useful when you lift it above your head and open it up. 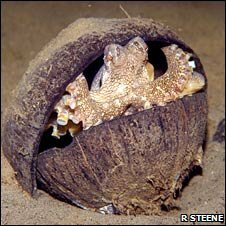 "And just in the same way, the coconut becomes useful to this octopus when it stops and turns it the other way up and climbs inside it." He added that octopuses already have a reputation for being an intelligent invertebrate. He explained: "They've been shown to be able to solve simple puzzles, there is the mimic octopus, which has a range of different species that it can mimic, and now there is this tool use.